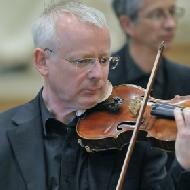 Robert is a freelance violinist, teacher and coach, and member of the Academy of St Martin in the Fields. Aged 13, he won a full music scholarship to Wells Cathedral School, and continued his studies with David Takeno at the Guildhall School of Music and Drama. There, he was a founder member of the Guildhall String Ensemble, and as its Leader/Director gave concerts at the most prestigious venues in Europe, North and South America and Asia. The GSE recorded extensively (with RCA and Hyperion) repertoire ranging from the complete sets of Handel and Corelli to the string works of Stravinsky, as well as many commissions from living composers. Alongside his work with the GSE, Robert worked with the English Chamber Orchestra for many years and appeared as guest Leader with many other orchestras, including the City of London Sinfonia, Bournemouth Sinfonietta and both English and Welsh National Opera. He led the Glyndebourne Touring Opera orchestra from 1990-2010, and has been Leader of the Garsington Opera orchestra since 1993. Robert taught the violin at St Paul?s School (Hammersmith) from 1997-2002 and at the JRAM from 2007-2010. He has coached at Pro Corda, is a regular coach at Grittleton Chamber Music summer course and has led several projects with the Southbank Sinfonia.